Do You Know When Hepatitis C Virus Transmission Peaked? According to a recent study (AC Spaulding, LS Miller. Lancet Infect Dis. 2016 Mar 30. doi: 10.1016/S1473-3099[16 …), peak transmission of hepatitis C virus (HCV) peaked about 1950, likely due to reuse of metal and glass syringes. 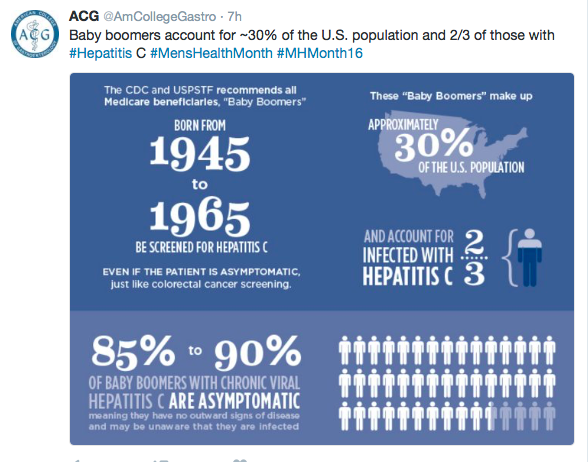 My take: Will this take away some of the stigma of HCV infection? Probably not. But, hopefully as the costs for treatment reduce, more individuals can be infection-free and avoid complications related to infections. This entry was posted in Hepatology and tagged hepatitis C, transmission by gutsandgrowth. Bookmark the permalink.